At Accorde Orthodontists, we pride ourselves in providing personalized, high-quality orthodontic care in a warm and welcoming office environment. Our doctors and highly trained team of orthodontic specialists work hard to design specialized treatment plans for each and every patient, and we only use the latest in cutting-edge orthodontic technology in our treatments. As important as the care we provide in office is, though, it's not the only part of ensuring your orthodontic success – equally important is how you care for your teeth at home. Chances are, you're already aware how important proper oral hygiene is for the health of your teeth. But while you're undergoing orthodontic treatment, it's even more vital. That's because the braces, Invisalign aligners, and other orthodontic appliances you wear during treatment create nooks and crannies that can trap food and create perfect hiding spots for bacteria and plaque, spelling bad news for teeth. So what's so bad about plaque? When the bacteria living in your mouth harden into plaque, they interact with bits of food in your mouth to create corrosive acids that eat away at tooth enamel. If left unchecked, this can erode the enamel away completely and create a cavity. Controlling plaque and bacteria through diligent, regular oral hygiene is an important part of ensuring successful orthodontic treatment. Believe it or not, the first step of proper oral hygiene is your diet. Just as certain foods are good and bad for your body, certain foods are good or bad for your teeth! When wearing braces, it's critical to avoid any foods that are hard, sticky, or loaded with sugar. 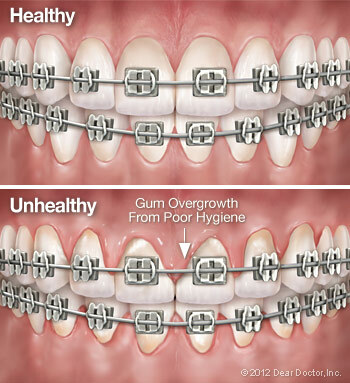 Hard foods have the potential to break brackets, while sticky foods can get trapped under archwires and in braces. Sugary foods combine with bacteria in your mouth to produce the acids that are responsible for cavities and decay. Additionally, you'll want to avoid chewing on anything like ice, pencils, or nails, as these habits can cause damage to your appliances or even chip your teeth. which is a small brush that looks something like a pipe cleaner and is ideal for cleaning hard to reach spots in your braces. To floss, you'll need the help of a special device called a floss threader. This is essentially a plastic loop with a long, pointed end. To use it, thread the floss through the eye of the loop, then thread the pointed end under your archwire. Pull it through so that the floss is run under the archwire, then floss normally. Repeat this process for every space between the teeth. In addition to the regular steps of brushing and flossing, we may recommend a fluoride supplement to help keep your teeth strong. This may be an in-office or an at-home treatment, so we'll discuss what the best option is if we feel it's necessary. Finally, you'll want to use an antiseptic mouth rinse regularly to keep your mouth clean and ease any irritation from your braces. If you're wearing a retainer or Invisalign aligner, you should brush it every time you take it out or put it back in. You can also soak it in a glass of tap water with a denture cleaning tablet once per day. When you're not wearing the appliance, make sure to keep it in its case - this both protects the appliance and helps prevent you from losing it. be able to provide a thorough, deep clean for your teeth while you're wearing braces, and they'll also keep watch for any signs of dental decay or disease and prescribe any necessary treatments. With careful, diligent, and conscientious care, you can keep your teeth healthy and strong during treatment and finish with a beautiful, healthy smile that'll last you a lifetime. And if you have any questions on caring for your teeth during treatment, we're always here to help! Feel free to call us at 763-425-9888 with any questions, or if you'd like to schedule an appointment, you can reach out to us at our contact page or use our easy online form. We can't wait to hear from you, and we wish you luck in keeping your teeth clean and healthy during treatment! f floss — that can help you get the floss between wires and gum line. Our staff will review proper brushing and flossing techniques with you when your braces are put on — but if you ever have questions, don't hesitate to ask!